Right now, as we speak, there are running shoes on the floor of my car. Not one pair of running shoes. Six. There are running shoes on a small rack pushed up against the side wall of my garage, on the way inside the house. There are running shoes in another rack to the left as you walk into the house, through the kids' playroom. This does not count the shoe rack inside the hall closet next to the front door. (There are running shoes there.) Nor does it count the shoe rack in my bedroom closet, or the overhead shelf above my hanging coats. Or the shoes that are stacked on top of shoe boxes, in my bedroom, three feet from my sleeping head. You know what's in those boxes, the ones that all the running shoes are sitting on top of? Running shoes. It wasn't always this way. In high school and college, I almost never changed shoes, and I never collected them. My usual modus operandi was to acquire one pair of training shoes and run in them until they disintegrated. I will grant you, I took this to extremes, some might say unhealthy extremes. A single pair of shoes could last me upwards of 1200, 1500 miles. My shoe maven friends cringed. But I was happy. Oh, was I happy. It was in my post-collegiate years that I started, for lack of a better word, hoarding. At first it was just the availability of the shoes. 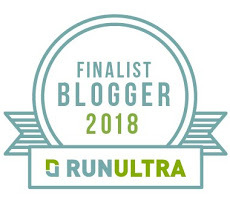 I was hanging around the Haddonfield Running Company, a fantastic specialty shop in South Jersey, and sometimes running for their store team. Shoes were plentiful. I acutally started wearing racing flats for some track workouts. I think that may have been what did it. Then, I owned a shoe store for two years, which gave me an excuse to try all different kinds of shoes, all the time. Now I can't go back. Sometimes they're free, sometimes they're discounted. I almost never pay retail. But somehow, I get them. Right now there are thirty-four pairs of running shoes in my house. I have thirteen pairs of Inov-8s, four New Balance, three adidas, three Brooks, two Asics, and assorted others. I have seven pairs of racing flats, including four brand new pairs of cross country or track flats that have yet to see the outside of their boxes. I count nine pairs of shoes that are seeing some sort of regular use, and ten pairs that have been worn less than five times apiece. 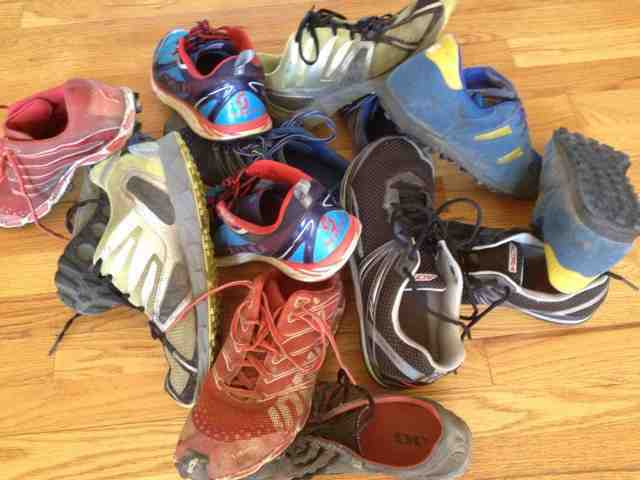 I have seven pairs of shoes that have too many miles and too much mud on them for any further running to occur. I have a pair of Brooks Adrenalines from 2008 with sheet metal screws drilled into the soles. I have the black Nike Air Prestos that I wore to my wedding. I have two pairs of shoes that I actually gave away to people and yet are somehow back in my house. I have a pair of fell running shoes from Bolton, England that cannot be purchased in the US. I have three pairs of Vibrams, for god's sake. I can't help myself. Two weeks ago I walked in to Rock and Snow to take a look at the Hoka One Ones (which I'll buy at some point, trust me) and left with an on-sale pair of New Balance 1010s because they were in my size. Right now on my phone's "To Do" list, I have reminders to try out two other pairs of running shoes that I don't even own yet. Which reminds me, if anyone wants to send me a pair of Montrail Fluid Flex or Salomon Sense Ultras, I wear a 10.5.